Out of the thousands of patients we have rendered care to over the last 25 years, Here are what several of them have to say about their experience in our practice. “Is your Body’s Innate default settings are to be Sick or to Be Healthy”? These testimonials reflect our observation from 25 years of being in practice. While they capture our amazement as we observe our bodies capacity for healing itself, always remember that one’s goal should not be to treat a “disease” or suppress a “symptom”. To keep a patient from dying ( maintain an airway, stop bleeding, stabilize vital signs) through emergency medical interventions. Utilize drugs, surgery and other medical interventions necessary to assist what the body can no longer do for itself due to the nature of the injuries. We all need this care in case of emergencies. IDENTIFY the cause or causes of whatever the problem you have been suffering from. ADDRESS the root cause or causes of your problem in the proper sequence that your body needs it to heal. SUPPORT the body in healing by utilizing methods such as nutritional supplementation, homeopathic remedies, diet and lifestyle changes to provide the support necessary for the body’s capacity to heal. Do you have a success story you would like to share? We’d love to hear your story! I Have All The Mobility Back! By Tricia G.
I just got to let you know that I have had some pretty bad wrist pain since March earlier this year. I had no idea what I did to it because I couldn’t remember an exact moment where I could’ve injured it. So I assumed I tweaked it during a fall and didn’t realize. A bunch of chiropractors (I went to 3 different ones) have tried to fix it with adjustments, xrays (nothing showed up), heat, ice, TENS, exercises but it still would not go away. I just assumed it was something I’d have to deal with for forever. BUT THEN, after the adjustment yesterday, 97% of the pain went away! I still feel a little bit of pressure, but I have all the mobility back! which is so amazing to me after all this time that I tried to heal it and just gave up. So THANK YOU SO MUCH!! 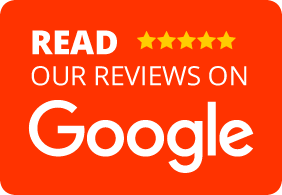 Pleased With The Care By Diana D.
I just couldn’t be more pleased with the care I’m receiving and look forward to each and every visit with Dr. Mariano. The office is always pleasant to enter and is decorated with a sense of physical and spiritual well being for all in mind. And the staff is truly courteous and caring. Before seeing Dr. Mariano for holistic care, this problem had been building up over 2-3 years. In that time I had seen two neurologists and was scheduled for carpal tunnel surgery. 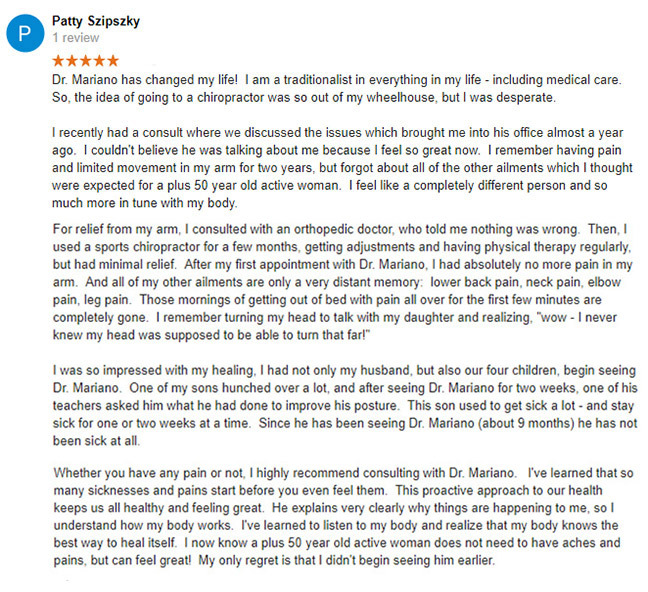 I have seen very positive results since receiving holistic care with Dr. Mariano. My hands have regained strength and dexterity. The numbness has gone away and I am knitting again. I am feeling much healthier, I am sleeping better, I have more energy and much less pain in my back and joints. I even feel more mentally alert. Now that I have regained my health I am planning on continuing work toward a graduate degree. I had to stop going to school 2 years ago because of my health. I am very glad that I found Dr. Mariano. I now feel like my health is moving in a positive direction and I am looking forward to being more active and involved in life. Helen E.
My Success Story (RSD) By Barbara G.
I cannot begin to explain the miraculous results I have achieved since seeing Dr. Mariano. Not only has my pain gone away, my emotional health is supported by being pain free, as I can look forward to living again. I am looking forward to enjoying life again with new prospects and challenges. I know that whatever lies ahead Dr. Mariano will be there to heal our mind, body and souls. Barbara G.
I am looking forward to living my life pain free. I plan to continue checking in with Dr. Mariano to make sure energy is flowing as it should be to keep up my good health. After suffering with terrible heel and ankle pain every time I took a step for two years, it is WONDERFUL to be pain free! N.E.T. has been a miracle to me. I will be forever grateful to Dr. Mariano for performing N.E.T. and Dr. Chamberlain for sending me to Dr. Mariano. Donna W.
The first results from care brought forth worse symptoms and I thought that Makayla needed to go back to the primary care physician. After about 2-3 weeks of care things began to get better. Now for the past year the attacks have been gone completely. Now that Makayla has regained her health I’m looking forward to never using the nebulizer again. Other members of my family have also benefited from care. My daughter Jillian had a bulge on her spine (from induced labor) and now it is gone. My son Christopher had bloody noses which have now gone away. Lastly, my husband Chris no longer has any acid reflux. Kelly B. When I looked up holistic practitioners, Dr. Mariano caught my eye because he is a chiropractor and I felt comfortable with that approach towards holistic health. Dr. Mariano and his team made me feel so comfortable because they actually listened to my concerns! Within weeks Kayla showed great improvement. After one month she had stopped vomiting entirely and now she only has spells of diarrhea once a month instead of three times a week! I had to get my entire family in here and fast! I scheduled myself immediately and at the time I was going through severe depression. I was sick all the time with urinary tract infections, sinus infections, stomach issues, and irregular menstruation. At first, I did not stick to my schedule of 3 times a week and I made excuses that because of work I could not make my regularly scheduled appointments. Because of a job change, I started to get on a more regular schedule with my adjustments and I noticed results immediately! I was able to stop taking Lexipro (anti-depressant) and Ambien (for sleep) and I feel great because I realize you do not need this medication to function. With the love and support of the team, I started the sugar control diet and my health improved greatly. Really great things started to happen in my life as a result. I was able to leave my stressful job, which was the major cause of my deep depression, and I started working in a great healthy environment instead! This caused a chain on positive events to occur. As I started to surround myself with the healthy people at my job, healthy people started to appear in my personal life. I was also able to stop smoking, and I felt more motivated to exercise as I approached deeper and deeper levels of my healing process. Overall, my experience has been a deeply rewarding cleansing process. My body continues to go through miraculous changes and I am still detoxing from the old patterns I had conformed to since I had never been adjusted as a child. This cleansing process has shown me that God has given us all a gift. Our body is miraculously self-healing – all we need is a chiropractor to help our bodies function at their fullest potential free of subluxations. I look forward to my continuous self journey as Dr. Mariano helps my body release the subluxations caused by everyday life. I also look forward to the deeper healing I get to experience with the advanced techniques, such as the neuroemotional and neuromodulation techniques Dr. Mariano offers. I am excited and happy to be able to have this oopportunity to improve myself, emotionally, physically and spiritually and I thank God for blessing me by showing me what my body has known all along. Tracy B. Since starting care with Dr. Mariano, it has been helping to deal with stress and anxiety and being OK with myself. I have also been able to get to the root and the core of the problem with NET & NMT. Because this advanced work relies on the bodies muscle testing, it helps people to address their past feelings and reactions. I am looking forward to facing the next stage of my lie now that I am learning to address my feelings and reactions to things in my life. I am currently working on job concerns and whether or not to change jobs. I am doing things I have always dreamt of doing without fear and having more confidence to do things in life Becky T.
So, goodbye 1st millennium medicine, hello again allergies; but goodbye seizures… My doctors (an Osteopath and a Neurologist) both good guys and both working together tried to minimize the impact to me knowing my aversion to medication. However, as with all medication, there is an impact, either too much or too little or some other areas of the body. Anticipating another sneezing, watery eyed, doped up summer, I agreed to take a chance with Dr. Mariano. I figured what the heck, he got Patty walking again. Maybe he had another miracle in his hands. Hey, it is the middle of summer and I have not touched a decongestant or antihistamine! Yahoo! I can count the sneezes I have in a day on one hand! My eyes only water during a particularly touching part of the movie “Terminator.” I have also negotiated a reduction in the epilepsy medication with my Neurologist. Not gone but getting there. I look forward to continuing to improve my health under Dr. Mariano’s guidance and coaching. I do want to get completely off of the epilepsy medication and the doping effect it has. While I have read and listened about the theory of Chiropractic care, I still find the practice and results amazing and phenomenal! I continue to have a gee-whiz feeling as continued adjustments improve my condition. I continue to be amazed at what is going on. Matt E.